Find hotel near Chettikulangara Bhagavath ..
Chettikulangara Bhagavathi Temple is a bustling 1200 years old Hindu temple where various annual festivals, vibrant performances, and floats are arranged. Jagadambika of Chettikulangara is the Goddess of Oodanadu, and she is named among the five Ambalayams. Followers of the Kerala’s genesis theory dictated by Parasuram; firmly believe that he established 108 Durga temples, 108 temples of Shiva, many Sastha temples, 108 Kalaris, Sakthi piths and five Ambalayams. Kumbh bharani is one of the famous festivals here. If you love Hindu culture, then you must put your foot into Chettikulangara Bhagavathi Temple to get pure essence of Hindu religious cultures. The darshan and pooja timings may extend during important festivals and rituals. 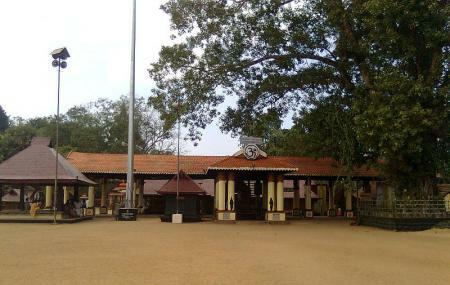 How popular is Chettikulangara Bhagavathy Temple? People normally club together Thirumullavaram Beach and Padanilam Parabrahma Temple while planning their visit to Chettikulangara Bhagavathy Temple. Divine!!! Marvellous place with great atmosphere, loved it. You can even meditate their no one will ever bother you. The committee member are providing free food too during noon. I like this place. And i proud of that. Peacefully and fresh air getting place The main festival is kumbhabharani. Its so awesom. Nice temple mainly the festival of that temple is very famous and popular.mainly(kumbabharani)and ( meenabharani). Easy to be found at any traffic . Nice famous Hindu temple. I come to see the temple and do some shopping and also check out the various social events happening in the festive season.